The Capitals never make anything easy. The Rangers always make everything hard. On Friday night, Washington was a mere hundred and one ticks of the clock away from the team’s first conference final appearance since 1998 — with 1:41 to play in Game 5, the Capitals held both a 1-0 lead on the Rangers and the Madison Square Garden crowd in silent captivity. It was New York’s own fault, though: Unable to score what felt like any goals this playoff series, the top regular-season team in the NHL had allowed itself to go down three games to one to a chippier, luckier, and deservedly cockier team. “All series, baby!” was what Alex Ovechkin chirped to Henrik Lundqvist after scoring a beauty on him in Game 1. The series was about to be over in five. Three days, two games, and seven goals later, the two teams are headed to a decisive seventh game, and nothing about the path has been evenly paved. On Friday, a late goal by Chris Kreider tied it up for the Rangers and an overtime snap shot from captain Ryan McDonagh kept New York’s slim hopes alive. On Sunday, Kreider scored twice more, in the opening and closing seconds of the first period, to give New York the makings of what it thought would be a comfortable Game 6 lead. The Rangers thought wrong. Sunday night’s game was something out of a Stefon bit from Saturday Night Live: It truly had it all. Buzzer-beating shots, late-game comebacks, a crescendoing monochrome crowd, overlooked icings and botched delays of game, remarkable saves, six-on-four power plays, demolishing hits, lucky bounces, dueling chants, slump-busters, turtling panic, confident declarations, and, in the end, utter fatigue. “I’m exhausted,” admitted Rangers goalie Lundqvist after a 42-save game, sweat still pouring down his face. Game 7 awaited. It almost didn’t happen that way. Midway through the third period last night, the Rangers were not only up 4-1, they’d earned goals from two maligned players in Rick Nash and Dan Boyle. (Both of their reactions were telling: Nash’s celebratory pose was not too far off from resembling a crucifixion, while Boyle seemed almost a little too happy to have scored.) Soon after, though, everything changed. Young Capitals sensation Evgeny Kuznetsov took advantage of a defensive zone breakdown to rocket the puck past Lundqvist, and just a few minutes later Joel Ward — a player who has, for years, presented an unsolvable riddle for New York — buried a rebound and sent the uniformly red-clad Verizon Center crowd into absolute bedlam. There was still more than nine minutes left, and any time the Capitals so much as acquired the puck there was a buzz in the building that felt like it could only culminate in a game-tying goal. 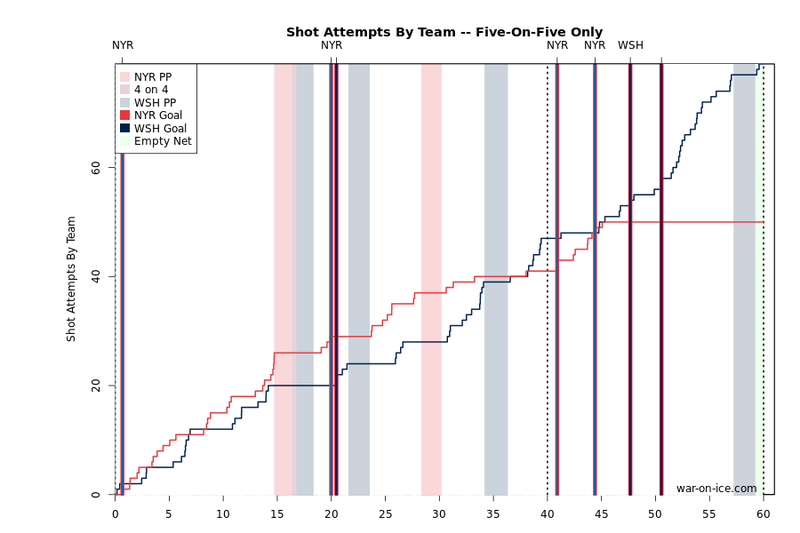 The prevailing vibe had veered from, There’s no way the Caps can score five goals on Lundqvist, to, Oh my god, they’re totally going to win this game, right? When Ovechkin barreled his broad body into McDonagh on the end boards and McDonagh skate-ran straight to the Rangers locker room with an injury, another piece of what felt like an all-timey comeback snapped into place. With less than three minutes to play, the Rangers’ James Sheppard knocked the puck over the glass and was hit with two minutes for delay of game. Replays showed that the puck had made contact with the boards before rising out of play — which ought to negate the penalty — but the call stood. It was one of several bungled decisions by the officials; an earlier missed icing whistle had led to one of the Rangers’ third-period goals. At the time, the Sheppard penalty seemed like an impending death blow, especially when the Capitals pulled goalie Braden Holtby for an extra skater. In hindsight, though, the two-man advantage was almost too good to be true for D.C. The Caps’ furious, chaotic onslaught became more deliberate and therefore more manageable, and the Rangers now had the added ability to legally ice the puck and melt time off the clock. By the end, New York had secured the 4-3 win and was preparing to return home for one more game. Toni L. Sandys/The Washington PostWith apologies to all actual parents, being a hopeless sports fan sometimes feels like raising a kid. Life is laden with small wonders and big disappointments; moods oscillate between wonder and fear. There are the late nights and the anxious mornings. A tiny, tentative stagger forward can buoy spirits for days. There is an utter selflessness to both endeavors — full capitulation to the whims of those outside yourself, the need to show up through thick and thin. Boundaries are never quite set, no matter how determined and loudmouthed the pledge that this is the last straw. Yet at the same time, the self-absorption is blinding and absolute. Just as parents can’t help but believe that their kid is the one true kid, sports fans are pretty much always convinced that their team is the one being screwed. The refs/league/TV networks are conspiring against them. Their history is uniquely fraught. Capitals fans, though, have a particularly strong case to plead. You can slice and dice their franchise’s historical heartbreak in all sorts of ways, but most of them add up to the same conclusion: Washington is not good at closing things out. Sixteen times since Ovechkin has been a Capital the team has played in a series-clinching game, and 12 times it has lost. Out of 13 Game 7s since 1987, Washington has won four. That this has frequently happened with Ovechkin and Nicklas Backstrom, two of the great players of their generation, on the ice adds an unpalatable layer of shoulda-coulda-woulda to the mix. The Rangers, meanwhile, have won six straight Game 7s at home and 13 of 16 games when facing elimination since 2012. It can feel silly to believe that these numerical flourishes, many of them dating back to old eras, might have any bearing on the rhythms and outcomes of a latter-day game. Does a loss from years ago really matter for a game this Wednesday? (Conversely, if you believe that one team is “due” for a reversal of fortune, are you any better than the failing gambler who keeps doubling down just one more time?) In sports, as in life, it’s as difficult to outrun low expectations as it is to live up to impossible ones. You can look at Game 6 and see the Rangers finally able to break out, scoringwise, or you can believe Derek Stepan’s assessment of the contest as “probably our worst game in the series.” You can see a Capitals team that blew it, or you can focus on how swiftly they were able to mount the near comeback. After the game, Ovechkin, sitting at his stall draped in several red towels, was confident that his team would be playing “either Montreal or Tampa” in the next round. No matter what happens in Game 7, one thing is certain: The fans of both the winning and losing teams will shake their heads in jaded disappointment or world-weary disbelief. The Rangers never make anything easy, they will say. The Capitals always make everything hard.